When it comes to keeping up with technology and treatment modalities, AKSM/Oncology is uniquely positioned to keep urologists on the cutting-edge of patient care, while maintaining complete clinical and financial control. AKSM/Oncology’s proven IMRT/IGRT physician-ownership models, including single-practice centers, are the next generation for providing a prostate cancer treatment option that previously was available only at hospitals. AKSM/Oncology offers “speed to market,” meaning your radiation center can be up and running, treating patients, in as little as six months through AKSM/Oncology’s proven project development work plan. 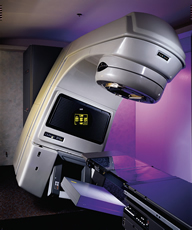 AKSM/Oncology also provides complete radiation center management services. AKSM/Oncology managers have the experience and knowledge to save the practice time and money while providing quality care growth strategies as the patient load increases. State-of-the-art care, delivered when you need it. That’s the AKSM/Oncology promise. If you would like to bring IMRT/IGRT to your practice, call Bruce McFadyen, Director of Project Development, AKSM, Ltd., at 1-877-767-5024.